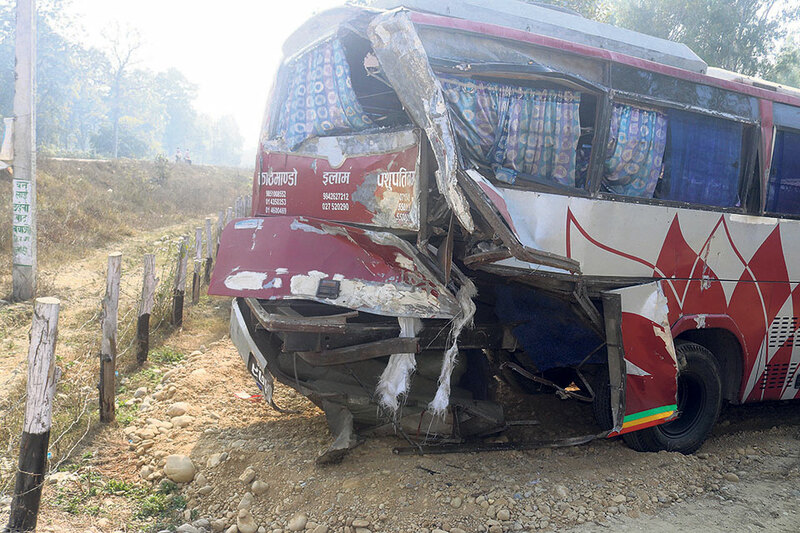 SARLAHI, Jan 20: Three people died while three more sustained injuries when a truck crashed into a passenger bus parked on the East-West Highway at Ishwarpur Municipality-12 of Sarlahi on Saturday morning. The truck (Na 5 Kha 7129) hit the ill-fated bus (Na 4 Kha 9754) parked for repairs near Banke Jungle area at around 2 am. The deceased have been identified as Govinda Sauden, 27, of Ilam, Binita Rai, 30, of Sunsari, and Rahim Miya, 35, of Parsa, according to Rajkumar Shahi, police inspector of the District Traffic Police Office (DPO), Sarlahi. All three of them died on the spot. Sauden and Rai were the passengers of the bus while Miya was apparently the driver of the truck. Meanwhile, Dawa Tamang of Nuwakot, Rajendra Khatiwada of Jhapa and Deepak Adhikari of Udayapur sustained injuries in the accident. They have been taken to various hospitals for treatment. "As per our preliminary investigation, Miya was the driver who had assigned his assistant to drive the truck," said Inspector Shahi, adding, "We could not find anyone else in the truck so we can't say much right now." As there was no haze or fog around, police have suspected a major negligence of the person driving the truck behind the accident. During the accident, some of the passengers were standing behind the bus when it was parked for repairs. The night bus was en route to Kathmandu from Ilam. The post-mortems of all three bodies were conducted at the district hospital in district headquarters Malangawa. Later, their bodies were handed over to their family members. Meanwhile, a minor was crushed to death by a passenger bus (Na 3 Kha 1512) at around 9 am the same day. The bus en route to Tribhuwannagar from Iswarpur Municipality killed Sonali Kumari Mukhiya, 6, of Brahmapuri Rural Municipality-3, Bhelhi. Police have taken the bus and its driver under control.